Inspired by the duality of both the simplicity and the complexity of mathematical wireframes, the Dodo pendant is a mathematical marvel to the eye. A classic shape reinvented, the pendant embodies timeless elegance and is a refined mix of industrial minimalism and sophisticated feminism. As simple as a shape can be, its wireframe plays tricks on the eye, making it either complex or simple when viewed from different angles. 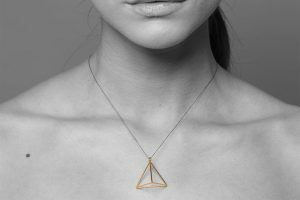 The pendant can be worn on the chest or as a ‘choker’, depending on your mood, style or the event. Its airy design will always leave a sophisticated impression. 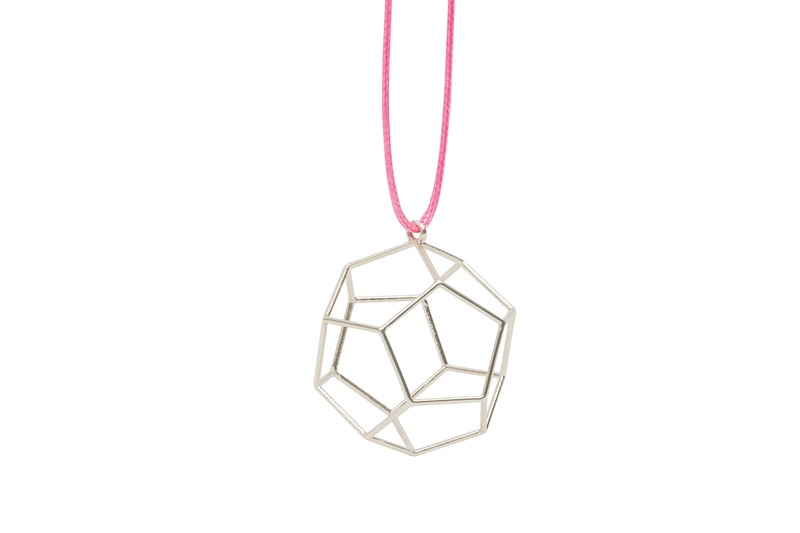 The Dodo pendant is modelled after a regular Dodecahedron. In geometry, a dodecahedron is any mathematical figure with 12 faces. 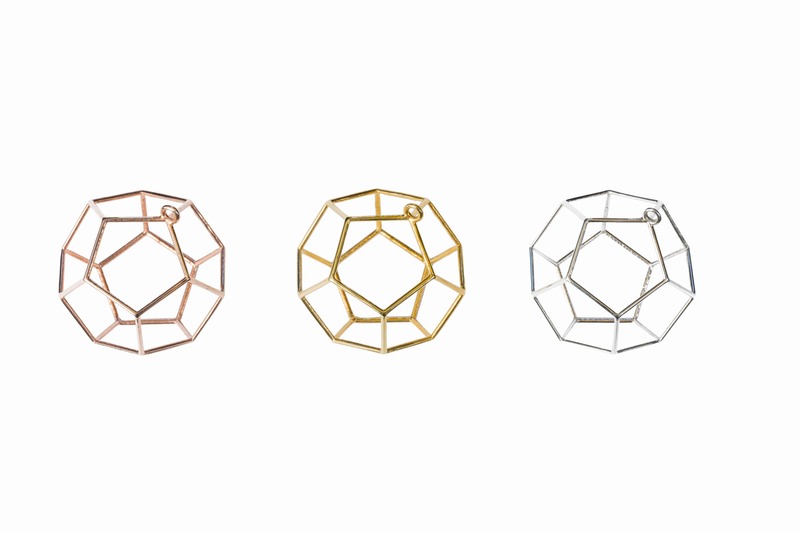 The great philosopher Plato believed he could describe our universe using just five simple shapes. He thought the Dodecahedron resembled our complete universe and everything in it. Some scientists even suggest our universe is shaped like a dodecahedron. 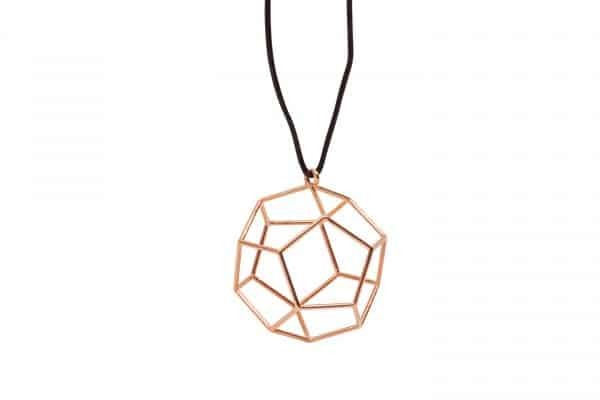 We are no scientists or philosophers, but we do know this pendant will make you look like you’re the centre of the universe during any event you may attend. 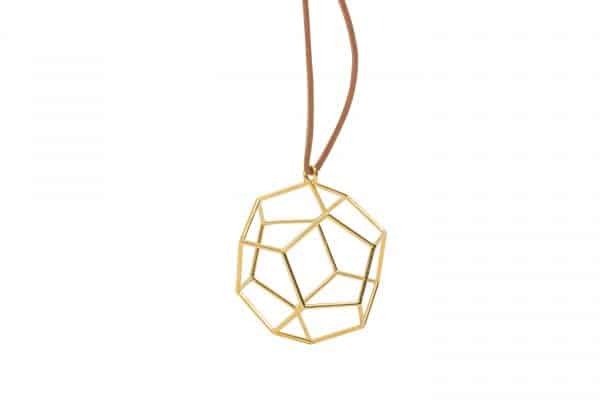 Each pendant is made through a process where the oldest and newest techniques of gold smithing meet. The pendants are made using the ‘lost wax casting process’. A 3D printed positive model in wax is covered in a ceramic coating, which is then heated to melt the wax, leaving a hollow mould to be filled with a molten metal of your choice. 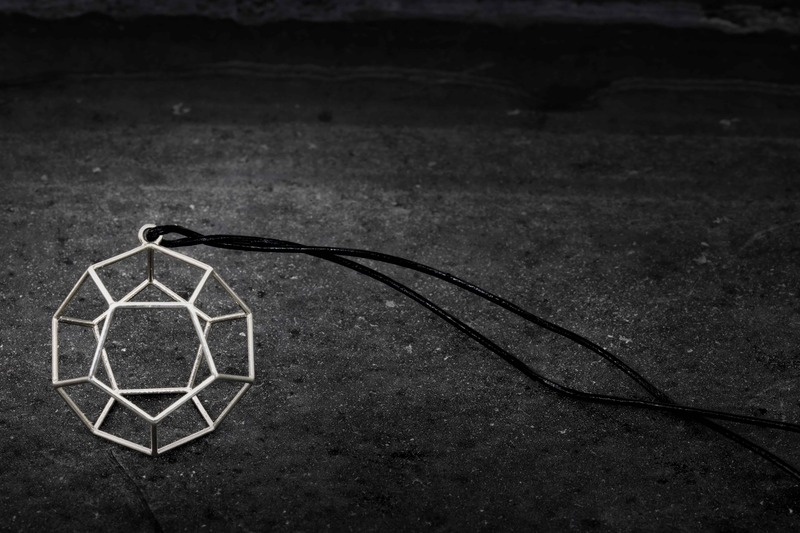 After cooling, the pendants are hand polished, plated with a metal of your choice and hand polished again. 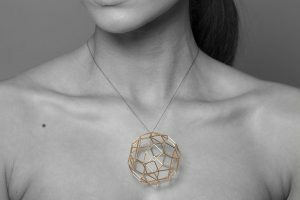 All pendants are available in gold plated, rose gold plated and Sterling silver* and come with a numbered certificate of authenticity, guaranteeing the quality and exclusivity of every object. 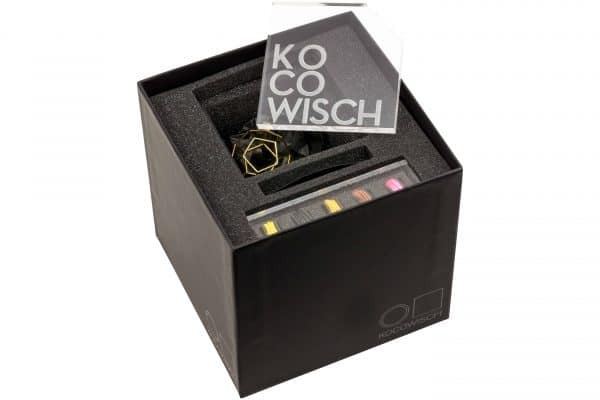 They also come with a wide variety of coloured cords and optionally with a beautiful thin golden necklace, making it the perfect gift for any occasion. 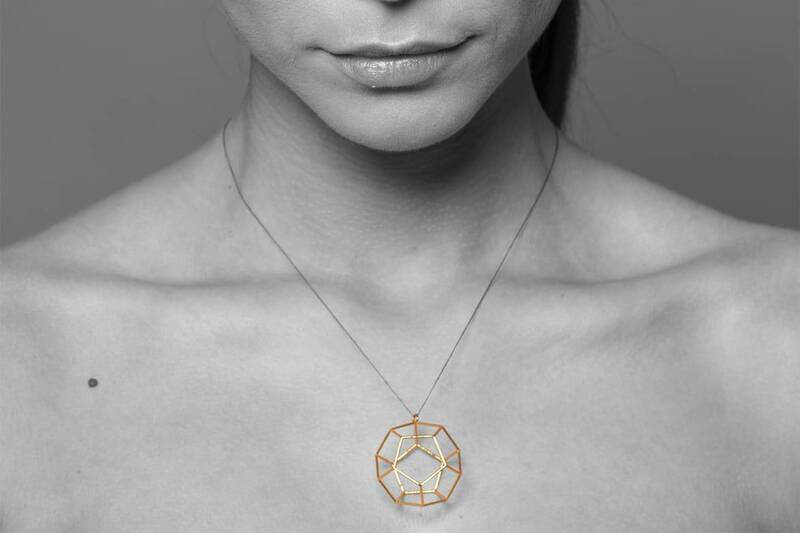 All jewellery forms part of the Kocowisch Kocohedron collection, an ode to the beauty and simplicity of mathematical wireframes. 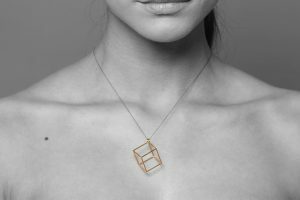 The collection consists of LED light fixtures (pendants as well as standing lights), pendant jewellery for women and accessories for men, like cufflinks and studs. * If you wish to order our jewellery in a different material, such as 24 carat gold or platinum, please contact us via info@kocowisch.nl. We would be more than happy to discuss all the options with you.